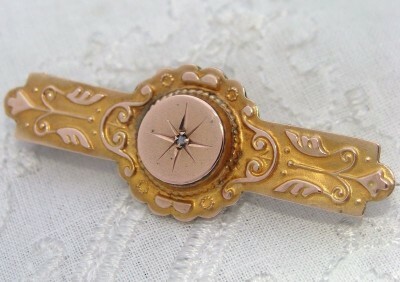 This is an Absolutely Fabulous High Quality English Antique brooch or pin complete with its original celluloid cover and bezel. They were popular so a memento of a deceased loved one, like a lock of hair or picture, could be enclosed and worn close to the heart. The pictures really do provide the best description – the body of the brooch features beautiful, bar-pin shaping with a medallion-like central motif. It is of yellow gold and adorned with applied decoration of Rose Gold which frames the Gypsy-Set or star-set genuine diamond. Its intricacy is amazing. The back has its oval window with the original cover and bezel in situ – VERY RARE. The original pin is in excellent working order. 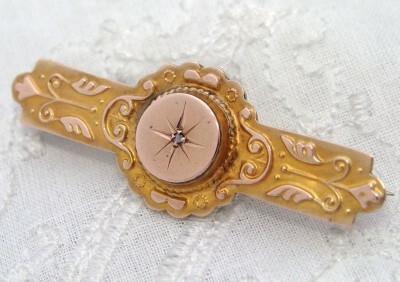 It has that silky smooth feel and the patina expected of quality Antique English Rose & Yellow gold jewellery. Excellent Original Antique Condition with no flaws (repairs or damage) to mention! You will be thrilled with this purchase as it is such much prettier than the pictures show. POSTAGE IS INCLUDED and I'll adjust once you've proceeded through the checkout (Paypal) or with a Bank Transfer, please send the purchase price only.